Stand Up Paddle Board – How to Choose the Right One! Two stand up paddle (SUP) boards float on a rocky shoreline. Stand up paddle board, or SUP as it’s commonly referred to, offers something for everyone. Paddlers are able to catch waves in the ocean or head out for a relaxing paddle on a tranquil calm lake. Some paddlers are seeking to do SUP yoga and some are looking for a fast paced, paddle style and core engaging work out. Whatever your SUP goals may be, having the right gear will definitely make the difference in an average outing or a truly fantastic one. To find the correct stand up paddle board, here are a few things you will want to consider. HULL TYPE: Two main choices, plaining hull and displacement hull. Hull choice will be determined by the paddling activity you plan to do most often. CONSTRUCTION: Inflatable stand up paddle board, or rigid? The board’s construction will affect performance, portability, price, weight and storage options. BOARD VOLUME AND WEIGHT CAPACITY: Stand up paddle board should be sized for paddler height and weight to ensure optimum stability and glide on water. LENGTH AND WIDTH: The length will effect maneuverability and wider boards are more stable on the water. THICKNESS: The board thickness relates to stability in relation to the rider weight. FINS: SUP boards fins add to stability and general board tracking. The hull or shape of a stand up paddle board plays a major role in determining how a board will react on the water surface. Most SUP’s are constructed using one of two main types: plaining or displacement. Displacement Hull – Stand up paddle boards with displacement hulls generally have a pointed nose/ bow similar to that of a kayak or canoe. This hull is designed to slice thru the water, pushing the water around the nose to the sides of the SUP board to improve efficiency and create a faster smoother ride. This added efficiency using a displacement hull requires less effort to paddle allowing the rider to travel farther and faster using the same effort. This model, for the most part, track great, but loose some maneuverability as a trade off. When thinking about SUP construction, there are two main types: inflatable or rigid/ hard. The inflatable type feature durable PVC materials with a drop stitch construction that create an air core. The drop stitch keeps the boards from bulging in the center while under extreme air pressure. This style is sold with a pump for inflation and usually a bag for storage and transportation. Paddling Whitewater: Similar to a raft an inflatable is better suited for brushing up against rocks in the river. Traveling and storage: Inflatables will be much easier to store and pack for traveling to your favorite spot. No need for surf racks mounted on your car! SUP Yoga: The nature of an inflatable stand up paddle board is more comfortable during yoga poses. The original paddle boards were rigid boards. This type is generally regarded as more rigid than the inflatable ones. This tends to create a more stable ride especially in choppy water or larger, heavier riders. Stability is important: A rigid board is a tad more solid than an inflatable board, which can provide a more stable feel, especially when riding waves. Rigid boards also tend to ride lower in the water, which can also create a more stable feel. You want to travel fast and far: Rigid boards tend to have a bit less drag than inflatables. This means they can be faster and more efficient when paddling long distances. You have a place to store it: Rigid SUPs can take up a lot of space. If you have ample room in your garage and a vehicle that can transport it, then a solid SUP is a fine choice. A stand up paddle board must work for your size. When a board does not displace the correct amount of water for your weight, it will feel very unstable. The SUP board weight rating and displacement are the two main factors in determining how stable a board feels on the water. 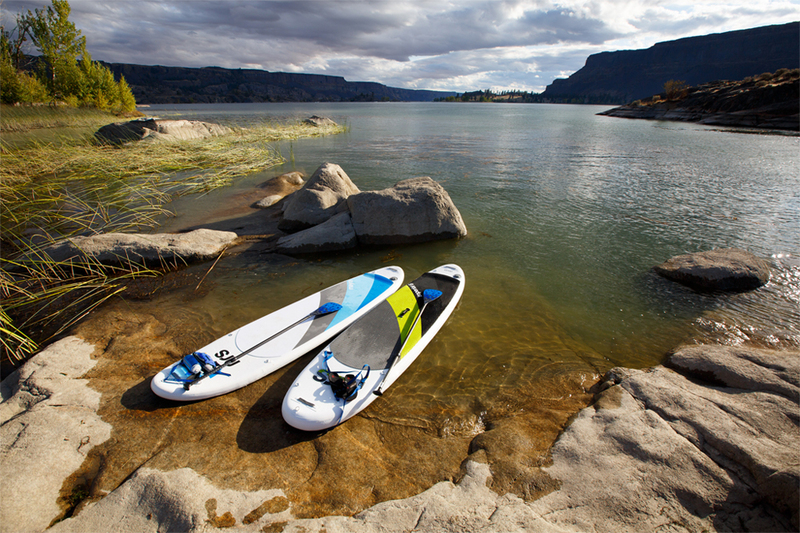 Volume: The SUP’s volume, generally discussed in liters, gives an idea of its ability to float with weight on it. The larger a board’s volume, the more weight the board can support and still feel stable. Size and shape determine volume. Smaller, fatter boards still have a larger volume, whereas longer, narrower boards will have a smaller volume, if thin. A big rider looking to do a little surfing will want a shorter, wider board with high volume. Weight Capacity: Every NRS paddle board is listed with a weight capacity. Too much weight on a board will cause it to ride lower in the water creating a less stable feeling and make it more difficult to paddle. In the inverse, a rider can never be too light for a SUP, so as long as you and your gear don’t out weight the maximum, then you’re fine to go paddle. Riding wave in the white water park and fast paddling on a calm mountain lake are different variations of stand up paddle boarding that require specific length boards to maximize performance. The general rule of thumb is, shorter boards are more maneuverable and longer boards ride faster. It is necessary to understand hoe the length directly relates to board volume and weight capacity. This relationship along with board width and thickness will ultimately determine how stable a paddler will feel. Short SUP Boards (9ft or shorter): This size is great for surfing waves or ideal for kids. Short boards tend to be more maneuverable than longer versions making this a perfect choice for wave surfing and all around kid’s board. Boards specifically designed for children usually have thinner construction, creating the right amount of float. Medium Length Boards (9ft – 12ft): These SUP’s tend to be great all around boards for wave surfing, river floats and calm lake fitness. Long SUP Boards (12ft – 15ft+): Longer boards are faster than shorter versions, plus the longer boards tend to track straighter. Touring SUP’s allow for more gear to be stored on deck without compromising stability. A stand up paddle board’s width is another important factor in determining stability on water. SUP boards are generally up to 36” wide to accommodate a variety of riders and abilities. Wide SUP Boards (31” or wider): A wide SUP will be more stable than a narrow version making this easier to stand on. However, a wide board will be slower than a narrow style. Narrow SUP Boards (30” or less): Narrow SUP boards are faster to paddle, but might feel less stable than a wider version. SUP Thickness: A thicker SUP will be more stable for the rider, but will also be less responsive to the riders feel. Heavier riders or paddlers with gear might opt for a thicker board. The fins on a paddle board add tracking and stability. In general, the larger fins with wide bases and longer front edges will track straighter and provide more stability that smaller fins. The benefit of a smaller fin is more maneuverability. In addition to selecting the correct SUP board, we recommend to size and fit the correct PFD. The US Coast Guard classifies a SUP board as a vessel, so it is required to wear an approved personal flotation device at all times.